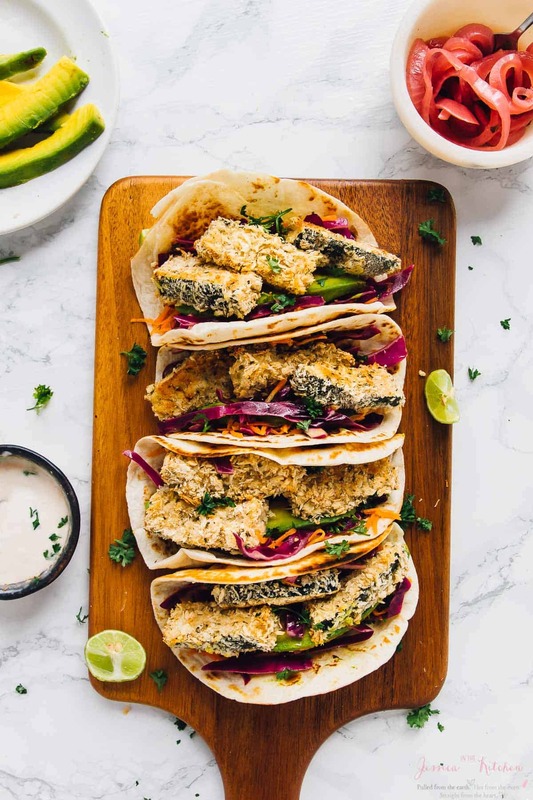 These Crispy Zucchini Tacos will impress you and your family or guests like crazy! Loaded with layers of flavour, so easy to make and topped with a dreamy lime crema! It’s my Birthday! Happy 26th Birthday to me! ? ? ? I’m actually writing this before my birthday, so I’m currently feeling like a major inception queen. What better way to celebrate than with tacos?! Exactly. These Zucchini Tacos are UNREAL. Who knew Zucchini could be so easily transformed?! Meaty texture, super crunchy outside, and they absorb flavour like whoa. Get ready to have your tastebuds thank you. Before we get into these tasty morsels, I can’t believe I’m 26! I thought I just turned 25, and all of a sudden I’m here. I’m always grateful for yet another year of life, and looking back, 25 was a pretty awesome year. From quitting my job to becoming a full time blogger, photographer and videographer, to celebrating my 1 year wedding anniversary and absolutely surrendering my heart to Tulum, Mexico. ?? ❤? ? It’s been an amazing journey. So many things happened this year. I gave my very first Jessica in the Kitchen speech (WHAT), got way better at meditation, decorated a home office (so fun), became a triple level Netflix member (just made that up), became mom to so many plants, and attempted (seriously) to become fluent in Spanish. I’m still working on the fluent part, but that’s okay. I swam RIGHT BESIDE fishes, something that used to terrify me endlessly, in two different countries, in the clearest waters ever. I got henna over and over. Went to a Sia concert. Drank way too many Caipirinhas in Brazil (then learned how to perfectly make one for my friends). I learned to celebrate just being alive (I’m looking at you, wine cork collection). I got my passport stamped over and over and over. Amazingly enough, I now feel a bit more stable in this crazy fun life of a full time blogger, and I have so much more going on for me than I can even stop to slow down and notice! I’ve hopped on and off of more planes this year, seen so many new places, and branched out to try so much new food. Case in point, making tacos out of ZUCCHINI. Oh Jessica, you millennial you. Let’s just thank the Mr. for this absolutely amazing taco idea. I went crazy once again at the farmer’s market, bought a whole ton of produce, and then laid it out, trying to imagine what to do with it. He immediately said well, zucchinis are so meaty when sautéed, like cauliflower when cooked, zucchini tacos! I’ll admit, I was not immediately sold on the idea, and scribbled it down anyway. After some thought, it struck me what an absolutely ingenious idea this way. Zucchinis are way adorable, when bought organic they’re HUGE, and they last forever in your fridge. They hold their shape so well and are actually filling. Plus, everything goes well with zucchinis. They’re the perfect ‘clean out the fridge’ meal. Needless to say, these tacos were perfect. I made them exactly like how I made my cauliflower tacos, because if it ain’t broke, don’t fix it. Saying a silent prayer that they would hold up just as well, I took these out of the oven and bit immediately into one. Clearly, I haven’t learnt my lesson because they were piping hot. However, they were so incredibly flavourful! Zucchini seems to hold flavour even better than cauliflowers, and my husband felt that the zucchini could be eaten alone for its flavour. Honestly, these came out so perfectly crispy. I ate about half a dozen pieces immediately, then forced myself to assemble these tacos. 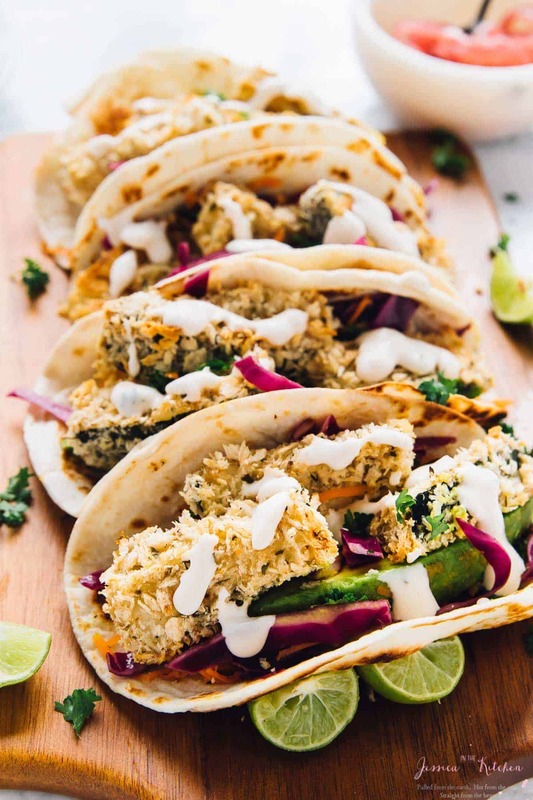 The brine and crunch of the kale cabbage slaw, creaminess of the avocados (or as I call it, God’s gift to man), and the creamy lime-y flavour of the lime crema makes this the ultimate loaded taco treat. Zucchini tacos, who knew? Clearly my husband did. 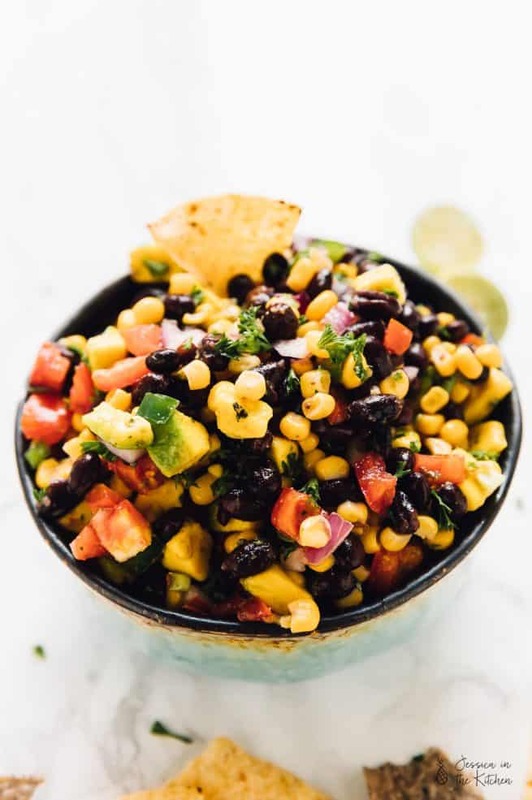 Squeeze some lime over the top for a burst of freshness and you’re ready to bite into this warm, crunchy and perfect taco. ? Promise me you’ll make this fresh then devour immediately. It’s honestly the absolute best way to enjoy it. Birthday promise to me, okay? 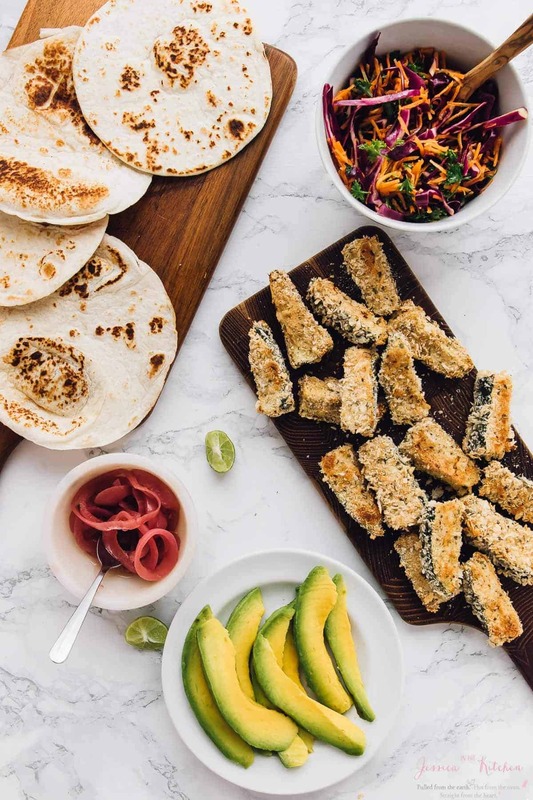 If you try these Crispy Zucchini Tacos please let me know in the comment section below, or tag me on instagram with the hashtag #jessicainthekitchen! For more exclusive recipes follow me on Instagram AND on Snapchat: jessinkitchen. 2. 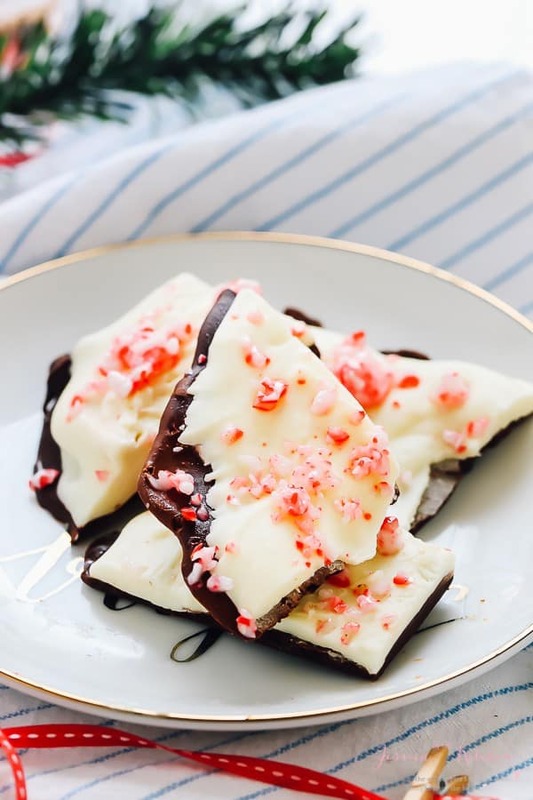 Prepare a baking sheet by lining it with a silicone baking sheet or parchment paper, NOT foil. 3. Cut the zucchini into spears about 3 inches long and an inch wide roughly. You can do this by cutting it like you would a potato into wedges. 4. In a separate bowl, whisk all the batter ingredients together EXCEPT the bread crumbs. Place the bread crumbs in a bowl. Line it up beside the batter bowl. 5. Toss the zucchini in the mixture one at a time, shaking off excess batter. Then, dip the zucchini into the breadcrumbs to coat, then place onto the baking sheet. Repeat until all of the zucchini spears are coated. 7. Remove from oven. Set aside. 8. Mix all the ingredients for the slaw together while zucchini20 is baking. Let sit on the counter or in fridge if not using immediately while everything else is being made so all the flavours can marry together. 9. While zucchini is baking, in a small food processor or with an immersion blender, blend all the ingredients together. Add a tablespoon or water to thin out the lime crema for drizzling if you so desire. Season with salt and pepper to taste. Place in a squeeze bottle and in the fridge until ready, or in a small bowl to spoon over tacos. 10. Heat 1 teaspoon olive oil in a skillet over medium heat (if possible, brush with a pastry brush). 11. Place a taco shell in the heat until golden brown spots appear and they are slightly puffy for a few seconds, then flip and cook the same. Set on a plate to assemble. 12. 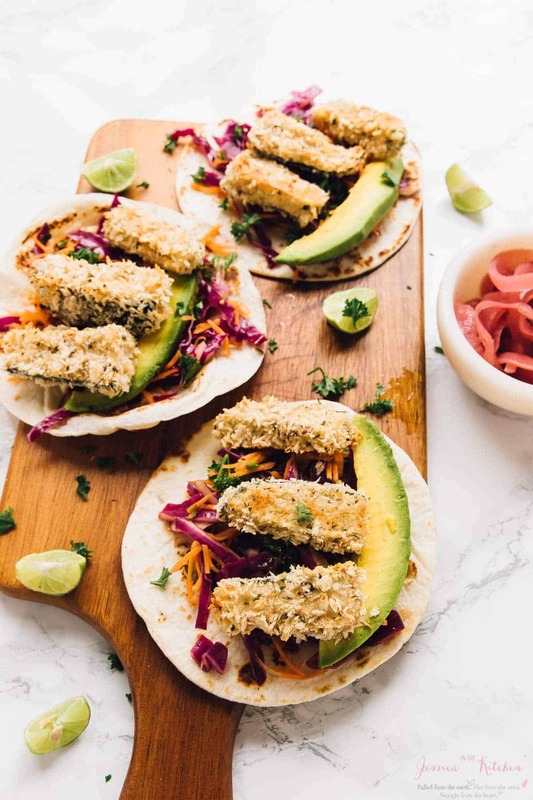 Layer with slaw, crispy zucchini and avocados over the soft taco shells. Add other toppings here if so desired. 13. 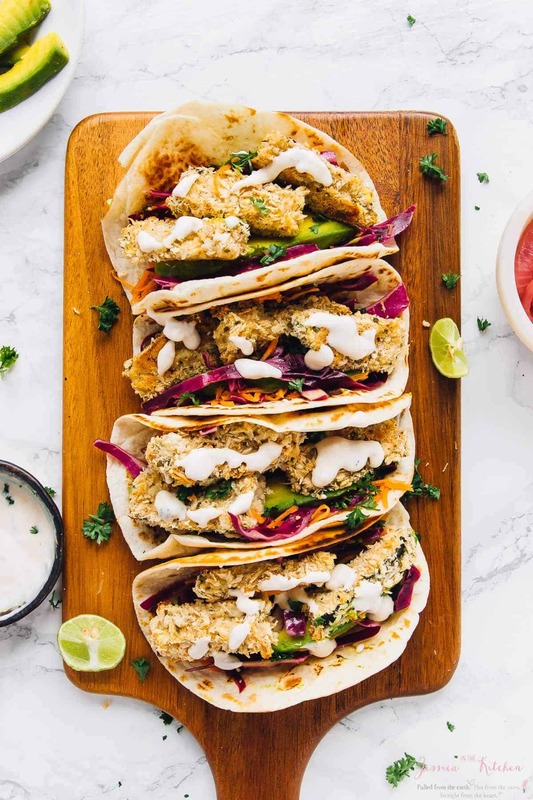 Drizzle the tacos with the lime crema. 14. Serve with limes to squeeze over for a fresh burst of flavour. Enjoy! !TO MAKE IT GLUTEN FREE Use gluten free breadcrumbs and soft taco shells. You can make the kale cabbage slaw ahead of time, even before you put the crispy zucchini tacos in to bake. Making it while it’s baking is just another option, although the flavours will marry together even better if made before. !HOW TO STORE You can make the different parts of the taco and store separately in airtight tupperware containers. Leave the slaw in its juices to keep it fresh and flavourful. When you’re ready to eat, reheat the cauliflower in the oven or a toaster oven, heat the tacos fresh and assemble. Happy Birthday, Jessica! 26…so YOUNG!!! 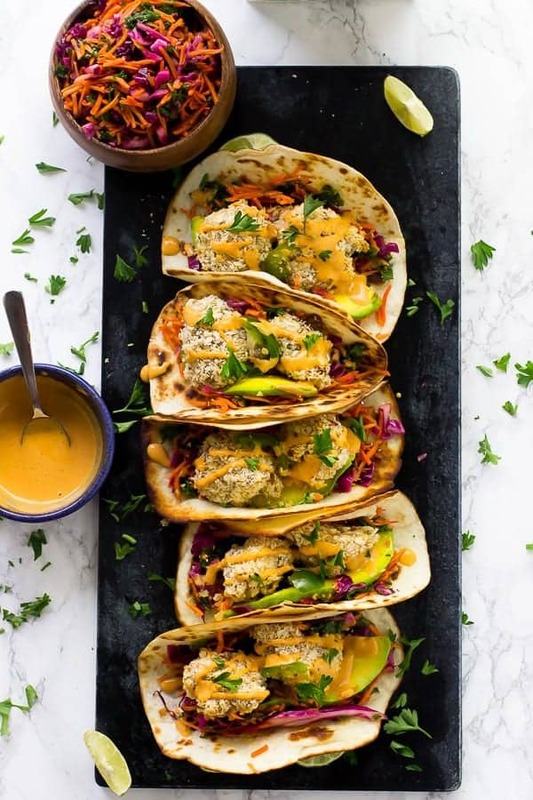 And you are right, these tacos are perfect for a delicious and healthy celebration.. I too made some red cabbage slaw and snacked them all the time..
Aw thank you so much Angie!! Cabbage slaw is the best! Thanks so much Bethany!! It’s SO great!! Perfect taco companion! ? This tacos dish looks delicious, I will try to make it for my family base on this recipe. Thank you for sharing! This Tacos looks awesome, I rarely eat Tacos, but I will try to make rely on this recipe. Thanks for sharing it! You’re my new favorite vegan blogger/chef. Sending all the good vibes! My daughter and I just made these tacos, and they are delicious! The recipe sounded interesting, and it did not disappoint! It was a great blend of flavors. I’m crazy excited to try your recipes. Can I use Hemp milk instead of Almond milk? Thank you for your love, light and time. Aww thank you so much! Yes you can :). I hope you enjoy and thank you for your kindness!! I am wondering if you have any appetizers using zucchini? Can’t wait to try these zucchini tacos. I’m going to a taco baby baptism and I need a dish to pass. I was thinking of an appetizer. 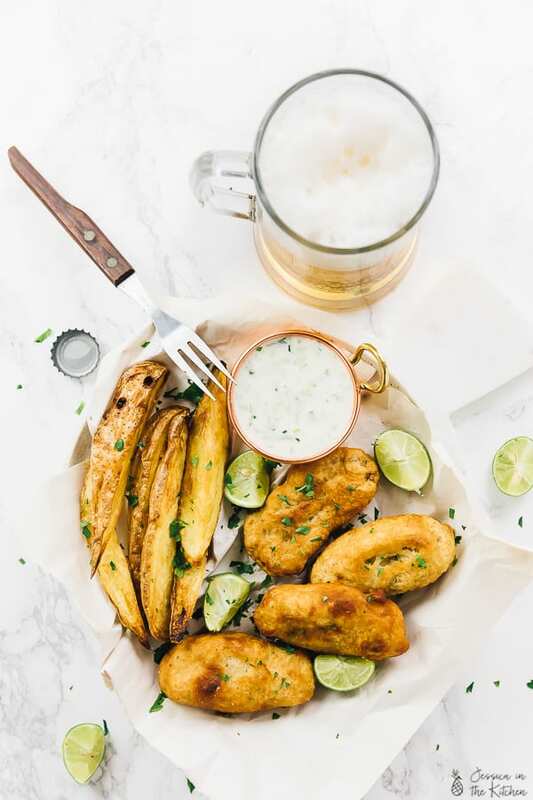 These zucchini fritters: https://jessicainthekitchen.com/vegan-zucchini-fritters-gf/ and these Lemon Garlic Zucchini: https://jessicainthekitchen.com/lemon-garlic-grilled-zucchini/ would be great appetisers. I hope you enjoy!! Oh my god, Jessica! Made these for book group tonight, and all my girls freaked out! They were so amazing. Paired it with the fruit salad with the maple lime dressing for dessert. You made me into a book group food hero! I win!! Thank you! AND threw together the pickled onions as well! Wow!